For Magdalena Lewy, the Beijing Olympics were supposed to be the realization of a dream that had been harbored for years. 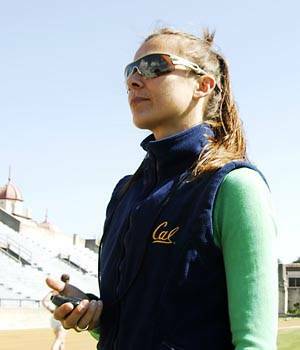 Ever since she missed out on qualifying for the women's marathon in Athens in 2004, the Cal track and field coach has worked tirelessly to position herself to make sure 2008 was not a repeat. But just like four years ago, Lewy's Olympic journey came to an abrupt end. This time around she was stopped short in the marathon after suffering a knee injury earlier in the week. "I slammed my knee pretty hard on a metal part of the arm of a seat in front of me as I was getting off a shuttle," Lewy said in an e-mail. "It was pretty swollen for a few days, but after some anti-inflammatories and plenty of ice, the swelling went down and I regained most of my range of motion." On race day Lewy felt sitffness in the joint but still decided to compete, believing that her knee would loosen up as it had during previous warm-ups. However, once she reached the 20-kilometer point, the pain was too intense and forced her to drop out. "To say that I'm disappointed doesn't begin to describe how I feel," Lewy said. "There's nothing worse than being in great racing shape and having the opportunity taken away because of one tiny little accident. It's a very helpless feeling." Nevertheless, Lewy does not come back from Beijing entirely empty-handed�; she was able to enjoy the company of her fellow athletes. Among the experiences that she recounts are getting the chance to talk with elite-level coaches, getting to know fellow marathoner Blake Russell and watching races on TV with U.S. sprinter Lauren Williams. These recollections have helped Lewy consider her Olympic experience a favorable one. "All of these memories, good or bad, will remain with me forever and have enriched me not only as an athlete, but also as an individual," Lewy said.